This plant stand will be ideal to organise and display potted plants in your home, garden, patio or terrace. Crafted from weather-resistant solid wood, this shelf is durable enough to be used outdoors year round. Attractively arranged, this shelf has plenty of room to keep your items in order. 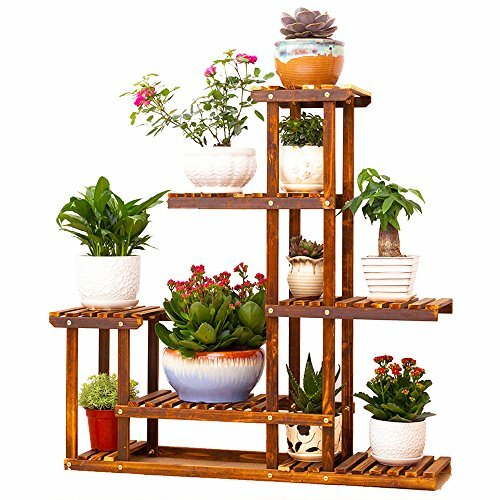 The plant stand is simple, yet stylish, and will make a great focal point. Before leaving the feedback,pls contact us. If you are satiafied with our service ,please leave us a positive feedback ,it is very important for us,thanks for your support. Indoor and outdoor Flower Stands: 6 layers of exhibition space add size and visual diversity for outdoor space, and turn your beautiful garden into a natural plant paradise full of space crisscross and rich sense. Succulent plants, Narcissus, cactus, roses, lilies, tulips, daisies and so on, your favorite. Simple and practical design: there is room for natural growth in flowers and flowerpots, so that your plants will enjoy the sunshine in a comfortable environment. Natural wood: the bonsai booth is made of pine wood, the city is environmentally friendly materials, and there is no source of pollution. In daily life, garden plant holder will bring you and your lovely plants close to the natural feeling. Strong bearing: UNHO PLANT STAND is strong enough to withstand strong winds and heavy rain. The maximum weight is 20 pounds. Rich and colorful use: in addition to displaying your lovely bonsai, you can also use it for the pictures of your beautiful memories, the small ornaments of the commemorative meaning, the trophy of the champion and the trophy. And your beautiful handicrafts and elaborate artworks as bookshelves or decorations. If you have any questions about this product by UNHO, contact us by completing and submitting the form below. If you are looking for a specif part number, please include it with your message.